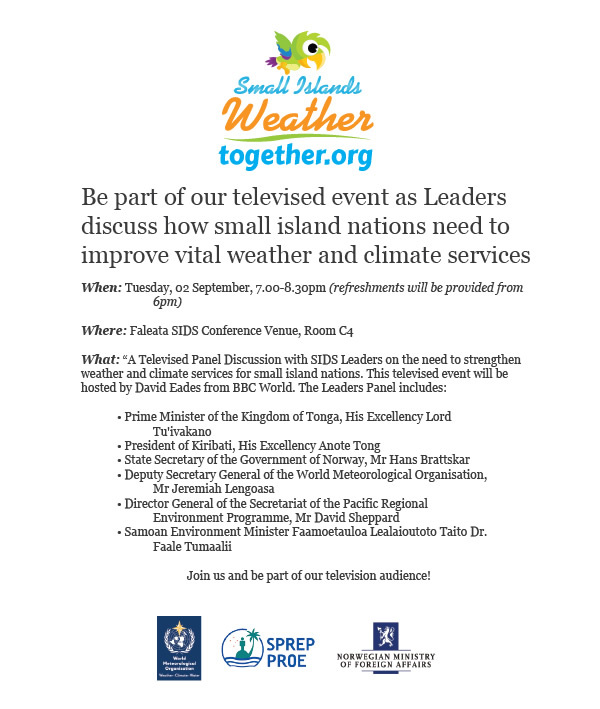 2 September 2014, Apia, Samoa - The cameras of world were focussed on Leaders of the Small Island Developing States as they took part in a televised panel discussion on the need to strengthen weather and climate services for small island nations. Hosted by David Eades from BBC World and broadcast to a global audience, this was an opportunity to showcase a Pacific perspective of extreme weather events and the need for small island nations to improve vital weather and climate services. For Samoa, the experience of Cyclone Evan, which devastated Apia in December 2012 are still fresh memories for many. "The damage caused by Cyclone Evan was estimated at more than $300 million US dollars. It has taken the development of Samoa back by many years," said the Minister of Natural Resources and Environment of Samoa, hon. Faamoetauloa Lealaiauloto Taito Dr Faale Tumaalii. Samoa is now better equipped to face these intense tropical storms with more certainty - "During Cyclone Evan, we did not have the infrastructure in place that we have now. We now have advanced climate and weather forecasts to provide early warning systems and we are better prepared than before". In Tonga, Cyclone Ian brought a great deal of destruction to the Ha'apai islands in early January, 2014. The cameras then turned to Dr 'Aisake Valu Eke, Minister of Finance and National Planning from Tonga who recalls the event. "The meteorological service was right on the mark and they provided warning six hours ahead to the people. I think we can enhance this going forward," said the Minister. Mr. Jeremiah Lengoasa, Deputy Secretary of the World Meteorological Organisation (WMO) has seen these issues affecting many countries: "The challenge is global. Significant progress has been made to develop early warning systems in Small Island Developing States. But there is more to be done. Is 6 hours sufficient for a hurricane warning? In fact we can see the early signs much earlier," said Mr. Lengoasa. "People need to have information and need to know what to do and where to go" said Mr. Hans Brattskar, State Secretary of Norway, speaking of early warning systems and the need for more financing to improve meteorological services in small Island nations. "The Pacific region has little responsibility for the problem it faces today: climate change. Industrialised countries have a major responsibility to make the investments we are talking about." "But the governments in the region have to show the political commitment to do the right thing. Partnerships make sense if you do things together. Weather is a global issue. Climate is a global issue. If you cannot do things together, we won't get anything done," said Mr. Brattskar. David Sheppard, as Director-General of Secretariat of the Pacific Regional Environment Program (SPREP), which works with the governments and administrations of the Pacific for the protection and sustainable development of their environment, has much experience building successful partnerships in the region. "It is important to look at the key role that met services in countries such as Australia, New Zealand and Finland play in supporting countries to develop and build capacity" said Mr. Sheppard. "We need these partnerships and we need investment for these programmes to be sustainable and durable". H.E. Anote Tong, President of Republic of Kiribati is no stranger to climate change policy issues. "The question is: will the resources required be made available? Because we do not have those resources," said the President whilst highlighting the capacity constraints his small nation faces. "Who has the moral responsibility for dealing with this? We are talking about human life and human values. When you have a boat and someone is swimming and he will drown if we don't put him on the boat. What is your moral responsibility?" The BBC televised event took place on day two of the Third International Conference on Small Island Developing States at the SIDS Conference Venue. The panellists represented the Kingdom of Tonga, Kiribati, Norway, Samoa, SPREP and the World Meteorological Organisation.